The Ciders of Spain tasting consisted of eight ciders, from four different Asturian producers, presenting some of the diversity which can be found in that region. The tasting took place at Pastoral Artisan Pizza, Kitchen, and Bar, which provided some snacks to pair with the ciders. Paul W. Marks Co. also supplied some Spanish cheeses, which were presented with all of the fixings, including some membrillo. Cider and cheese is a no-brainer food pairing, and I certainly love the wonderful cheeses of Spain. Chef de Cuisine Jeff Messer created a delicious wild mushroom pizza and maybe a cider isn't the first pairing you would consider for such a dish. However, there are good reasons why some of these ciders were a killer combination with the pizza. Umami is the fifth taste, often described as meaty or savory. There are a few different sources of umami and mushrooms are a rich source of guanylate, giving them a strong umami taste. Now, some of these Spanish ciders, especially the more traditional styles, possess significant amounts of glutamic acid, which also provides a strong umami taste. And when you combine two foods with umami, especially from different sources, it creates a synergistic effect that intensifies the umami taste. And that happened here, with the mushroom pizza and more traditional ciders. Just wow in your mouth, a savory explosion of flavor. Sidra Fanjul extends back to the late 19th century, when the maternal grandfather of Don José Ramón Fanjúl Palacio established a cidery known as El Roblón. In 1944, Antón de la Sierra changed the name of the cidery to the family name, and he passionately defended the rights of Asturian ciders, battling taxes and helping to establish the first Cider Press Association of Asturias. When Anton died, his brothers took over the cider and decided in the 1970s to auction it. Fortunately, Anton´s sister, Josefa Fanjul, made the first and only bid, winning the cidery, and then handing over management of the business to her son Jose Antonio. Jose helped to restore and preserve some of the old equipment, eventually turning it over to his own son, Carlos, in the 1980s. The Fanjul Sidra Natural (about $9.50/700ml) is a traditional, unfiltered sidra (with a 6% ABV) made from a blend of Asturian apples, such as Clara, Blanquina, Raxo, De la Riega, Xuanina, Perico, Verdialona, Regona and Durona de Tresali. One of its only non-traditional matters is that the sidra is fermented in oak rather than traditional chestnut. This is a dry cider, with a strong earthiness, intriguing apple flavors, some nutty accents and some tartness on the finish. Such a delicious and compelling cider, and very different from most American-made ciders. I love its strong umami element, seeing some similarity to Kimono/Yamahai Sake. It was a superb pairing with the mushroom pizza and ended up being one of my Top Three Sidras of this tasting. Sidra Viuda de Angelón (the "widow of Angelon") was founded in 1947 by Alfredo Ordoñez Onís at the orchards of La Alameda. In 1978 the cidery was moved to La Teyera, Nava, home of the annual Asturian Cider Competition and the Museo de la Sidra de Asturias. It is still a family-owned and operated artisan cidery. The 1947 Sidra de Nueva Expresion (about $13/750ml) is a petillant semi-dry cider (with a 6% ABV) made in a more modern style. It is a filtered sidra, made from estate apples, and possesses a strong, appealing apple aroma. On the palate, it presents as mostly dry, with only the slightest hint of sweetness, with a mild effervescent, enough to be a nice palate cleanser. It has delicious apple flavors with a lengthy pleasing finish. This was also one of my Top Three Sidras of the tasting. The Viuda de Angelon Sidra Brut (about $16/750ml) is an off-dry sparkling dry cider (with a 6% ABV) that is produced by the Charmat method, creating the bubbly. It presents as mostly dry, with only a hint of sweetness, but many more bubbles than the 1947. It has a smooth, apple taste that will please many cider lovers. Personally, I preferred the milder effervescence of the 1947. The Viuda de Angelon Sidra De Pera (about $3.50/330ml-available in a 4-pack) is a sparkling off-dry pear cider, a perry, with a 5.2% ABV. Using estate grown pears, this is an impressive cider, with a harmonious blend of earthiness with subtle pear flavor and a mild effervescence. It is dry and refreshing, with more depth than most perry ciders I have tasted before. Absolutely delicious and it too went very well with the mushroom pizza. It earns a spot in my Top Three Sidras of the tasting. The Viuda de Angelon Daimantes De Hielo (about $21/375ml) is a sweet frost cider (with a 11.5% ABV). To make this cider, they freeze freshly pressed apple juice which is later gradually drip-thawed to concentrate the sugar and flavor intensity. It is then fermented and aged, creating a sweet dessert cider. It has an appealing aroma, with a rich, sweet taste of apples, honey, and caramel. It was a bit too sweet for my own preferences, and I would have liked more acidity to balance the sweetness. However, it does do well with a hard cheese. Guzmán Riestra Riestra was founded back in 1906 by Robustiano Riestra and it eventually was passed on to his daughter, Etelvina Riestra. With her husband, Ricardo Riestra Hortal, they eventually implemented some modernized advances. Today, the ciders is in the hands of Raul and Ruben Riestra, the great grandsons of the founder. The two ciders we tasted from their portfolio both are blends of apples from Asturias and Normandy. The Sidra Natural Riestra (about $9.50/700ml) is a natural, dry, unfiltered sidra (with a 6% ABV) made in a very traditional fashion. It possesses only a very mild earthiness, with much more rich apple flavors and stronger tannins. It is dry with sour and bitter notes as well as good acidity. It went very well with the various cheeses, and it is said it holds up well with cured meats too. The Guzman Riestra Sidra Brut Nature (about $16/750ml) is a sparkling dry sidra (with a 8% ABV) made in the Methode Champenoise. It is dry with moderate bubbles, a mild earthiness, a bright apple flavor , a hint of tropical fruit, and a pleasingly long finish. It has similar tannins to the other Riestra and this can stand up to stronger foods, like cured meats. Sidra Trabanco was founded in 1925 by Emilio Trabanco and now the fourth generation is in control of the ciders. Over the years, the family has continued to improve the quality of their cider and add modern techniques and technology. In addition, they have expanded their business to include a number of new products. The Sidra Avalon (about $4/33ml, available in a 4 pack) is a semidry sparkling cider (with a 5.5% ABV). It was the most American of all of the ciders, easy-drinking, bubbly and sweet with a strong burst of apple flavor and some tartness. This would appeal to those who enjoy some of the large, commercial ciders made in the U.S. I much prefer the more dry Spanish ciders, but there is certainly a market for this type of sweeter cider. Overall, this was a fun and educational tasting, showcasing some of the diversity that can be found in the realm of Spanish sidra. My Top Three Favorites of the tasting were the Fanjul Sidra Natural, Viuda de Angelon Sidra De Pera and the 1947 Sidra de Nueva Expression. I generally prefer more traditional ciders and I love the earthy flavors that can be found in some of them. If you enjoy cider, then you need to explore Spanish ciders, to learn about a more than 2000 year old tradition. And be sure to pair your ciders with various foods, to learn how cider be do well with many different dishes. 1) Connecticut pop-up venture, [oink], is taking over the kitchen at Ribelle in Brookline for three nights in late February. Titled the “CT Chef Takeover”, the collaboration dinners are meant to give the city of Boston a taste of what Connecticut chefs are up to. The dinners will be different menus each night and will be 5-7 course tastings ranging from $65-$85. The chefs collaborating with [oink]‘s Craig Hutchinson and Alex Lishchynsky will be Matt Wick of River Tavern on February 23rd, James Wayman of Oyster Club on February 24th, and Tyler Anderson of Millwrights on February 25th. Ribelle owner/chef Tim Maslow and [oink] co-chef Craig Hutchinson worked together while opening Ribelle in 2013. Hutchinson became the first Chef de Cuisine of Ribelle and the restaurant received the coveted “four stars” from the Boston Globe. Since then Maslow has gone on to win Food & Wine’s Best New Chef award. Maslow offered the restaurant to Hutchinson as he will be in Montreal at a food festival for those 3 nights. Menu’s have yet to be written and tickets go on sale soon, however these dates and chefs have been finalized. 2) On Wednesday, February 10, Tony Maws will welcome Chef Deuki Hong and writer Matt Rodbard to The Kirkland Tap & Trotter for a one-night-only event celebrating the soju-slamming, pepper-pounding, kimchi-everything adventure that is Koreatown: A Cookbook (Clarkson Potter/Publishers; on sale February 16, 2016). For two years, co-authors Hong and Rodbard gathered recipes, stories, in-the-moment photos, and thoughtful interviews from Korean American neighborhoods all across the country to comprise their portrait of a culture in Koreatown. With a penchant for global comfort foods, killer wood grill to complement the flavors of Korean barbeque, and convivial atmosphere, Kirkland is the ideal place to kick-off the cookbook tour. --Option 1: Guests can book seats at one of Kirkland’s communal tables and enjoy a family-style dinner and discussion with Hong and Rodbard, as they dig into dishes such as marinated and grilled Korean-style Beef Short Ribs; and, Kimchi and Bacon Fried Rice with Gochujang Butter. The evening includes dinner, a complimentary welcome cocktail, and a signed copy of Koreatown for $48.00 (exclusive of tax and gratuity). --Option 2: The Kimchi and Bacon Fried Rice will be on the menu at Kirkland for any/all to enjoy that night, in addition to the restaurant’s a la carte menu. The cookbook will also be available for purchase for $30.00. TICKETS: Advanced online ticket purchase is required for dinner at the communal table: https://www.eventbrite.com/e/feast-to-celebrate-the-debut-of-koreatown-a-cookbook-tickets-20933491637. Space is limited, and guests are encouraged to book ASAP. Seatings at the communal table are 6:30pm and 8:30pm. The Kirkland bar and dining room opens for a la carte dinner service at 5:30pm. 3) I'm back with a couple more restaurants which will have snow emergency specials this winter. During declared snow emergencies in the city of Boston, Coda will be offering a grilled cheese and tomato soup special. Variations may include braised beef grilled cheese among other flavors. Also during declared snow emergencies in the city of Boston, Pastoral Artisan Pizza, Kitchen, and Bar will be offering its margherita pizza with a select beer, normally priced at $24, for $18 at its bar. 4) Beginning February 1, Tryst, located in Arlington, will launch its all new pop-up concept, “Covengno” every Sunday through Tuesday from 5pm-10pm. Convegno, translating roughly to mean “tryst” in Italian, is Chef Turano’s new Italian-inspired menu which will be offered in addition to the regular menu every Sunday through Tuesday. Guests can choose from three pasta dishes including: hand cut tagliatelle with shrimp, olio santo, garlic and lemon; stuffed pasta with Sunday gravy; Roman Style Gnocchi with roasted winter vegetables, toasted pine nuts & brown butter; and orecchiette with house made chicken sausage with rabe & chilis. Each dish is $18 and will be served with a house-made to go cannoli. Every few months Chef/Owner Paul Turano plays around with his concept. From his popular AFC, “Arlington Fried Chicken” to T’s BBQ joint, T’s Clam Shack and most recently T’s Taco Bar, each concept represents a fun trend in dining that Chef Turano and his team want to experiment with. “We like to take everyday items and play with them at the restaurant. Sometimes I think you need to pay homage to where a dish comes from, but sometimes you simply need to use the concept as a vehicle to push the concept further,” said Turano. Convegno will launch February 1 and will be available through spring 2016 for both dine-in and take-out. 5) Osteria Nino will be opening its doors to welcome San Valentino at 3rd Ave in Burlington. Throughout Valentine’s Day weekend, this authentic Roman kitchen will be dishing out a collection of treasures from the local seas in addition to a decadent dessert. To start, executive chef Walace Benica will serve Oysters & Shrimp with mignonette and cocktail sauce ($15). For the pasta course, there is Lobster Pappardelle with tomato and prosecco broth ($26) and the main course is a Prosciutto Wrapped Monkfish with beet risotto ($26). To end the romantic evening with something sweet, there is a Chocolate Mousse Cheesecake with chocolate covered strawberries ($10). Osteria Nino’s all-Italian wine list has extensive sparkling options by the glass and bottle, including prosceccos, rosés, moscatos and franciacortas. Highlights include the Vigne di Alice sparkling rosé ($11/45); Sul Lievito DOCG Adami, a bone-dry prosecco with small lively bubbles ($40); and Barone Pizzini DOCG Brut, a pinot noir structure rounded out by chardonnay and bubbles ($60). 6) Lydia Shire alongside executive chef Simon Restrepo and executive sous chef Alex Pineda now are dishing out a seasonal menu brimming with wintertime’s most comforting tastes at Scampo. Italian for “escape,” Scampo is providing diners with a winter retreat laced in delicious flavors and warm hospitality. To whet your appetite, there are a series of new starter courses. In the “Handmade Breads” category, there is the Roti, served with or without chili, cumin lamb meatballs ($5/10) and Hot Flaky Moroccan Flatbread with petit Moroccan salad bites ($10). On the pizza side, there is a Long Cooked Broccoli & Speck with sweetened ricotta and spicy pecans ($19) and White Pizza with truffle cheese, mushroom duxelles and a Vin Santo and fig preserve ($25). The Winter’s Chestnut & Roasted Garlic Soup is poured tableside over crisped duck leg confit ($16) while the Scampo Twice Fried Chicken ‘Paddles’ sees a trio of wings served up with sweet potato tempura ($15). For sea treasures, there is the Manila Clams Limoncello steamed with hot oil sashimi of Shire’s signature “#1 tuna” and Hamachi ($21) and Brown Butter Crab Cake with Peekytoe Maine crab, English mustard and pomelo aioli ($21). Other new appetizers include Beef Tenderloin ‘Minute Steak’ with duck fat fried gaufrettes, quail egg and caviar ($24) and Hungarian Mangalica Prosciutto with crushed Marcona almonds and hot tangerine soufflé ($36). From the signature mozzarella bar, there are a duo of newcomers: Mozzarella with Prosciutto & Warm Black Truffle Gougere, black radish and pineapple crema ($26) and Beef Sirloin Carpaccio with fried artichokes, zested winter citrus and Aleppo pepper ($21). The “Handmade Pasta e Risotti” offerings have been refreshed to include Pear & Pecorino Ravioli with grilled trevisano and warm potato ‘butter’ ($18/28); Preserved Tomato Tortelli with crisped skate wing, garlicky toasted hazelnuts and saffron aioli ($19/29); Handmade Whole Wheat Bigoli with baby lamb ragu, giant yellow raisins and pale celery leaf chiffonade ($19/29); and, Wild Rapini Rissoto with grilled “Greek style” quail, skordalia, dill and burnt lemon ($24). 7) Alpine Restaurant Group’s Posto will be offering guests limited-time only dinner specials in addition to their regularly available menu on Valentine’s Day weekend. 8) Saloon will welcome Cupid to Davis Square this Valentine’s Day weekend. On Saturday and Sunday nights, executive chef Shayne Nunes will dish out two nights of specials laced in comfort that are designed to complement Saloon’s 120 rare whiskey selections. On Saturday evening, Chef Nunes’ will dish out a customizable three-course prix fixe menu with optional whiskey pairings and the items also will be available a la carte. Appetizer options include Fried Oysters with kimchi tartar sauce ($12) or Honey Glazed Baby Carrots with pistachio-basil ricotta and crispy parsnips ($9). For entrees, there is Stout Braised Short Rib with roasted rainbow carrots, cauliflower puree and pickled red onion ($26) or Sweet Potato Gnocchi with chanterelle mushrooms, baby kale, parmesan and maple cream ($21). For a taste of decadence, there is an Espresso Molten Lava Cake with brûléed banana and hazelnut ice cream ($7) or Clementine Panna Cotta with citrus curd and roasted pistachio crumble ($7). On Sunday evening, appetizer specials include the Chipotle Vanilla Butter Poached Lobster Tail with Applewood smoked bacon, clementine, frisée and avocado crème ($18) and Roasted Beets with mesclun and chicory greens, pistachio and a goat cheese fritter ($12). Chef Nunes has designed two entrees, a Pan Roasted Filet Mignon with truffle whipped potatoes, crispy shallots and mushroom demi-glace ($38) and a Sweet Potato & Red Quinoa Hash with chanterelle mushrooms, baby kale and lemon-maple ricotta ($18). For those with a sweet tooth, there are a duo of desserts: Espresso Molten Lava Cake with brûléed banana and hazelnut ice cream ($7) and Clementine Panna Cotta with citrus curd and roasted pistachio crumble ($7). COST: Saturday: Prix fixe available for $40 per person or $65 with whiskey pairings; specials also available at a la carte pricing. Sunday: Specials available at a la carte pricing. 9) Chef/Owner Will Gilson and the Puritan and Co. team invite guests to join them for a night of all things sparkling wine at their upcoming Bubble Rumble. The winter counterpart to Puritan and Co.’s popular summertime wine rumble event Rosé Rumble, Bubble Rumble will offer guests the opportunity to immerse themselves in the best bubbles in Boston like a true insider. Taking place on Wednesday, February 10th, Bubble Rumble will showcase a variety of sparkling wines for guests to taste, discuss, and learn about while enjoying bites from Chef Will Gilson and the Puritan and Co. team. The night will feature two, separately ticketed sessions- one at 5:30 p.m. and one at 8 p.m. Tickets are $80 and can be purchased here: http://bit.ly/bubblerumble2016. Guilt is "feeling bad because you have done something bad or wrong" and it's time to eliminate some of the guilt in our lives. We need to eliminate that guilt which is actually unnecessary though we have been programmed to think we are doing something wrong. I'm talking about guilty pleasures and specifically as they concern food. Though I've thought of this issue before, it came to the forefront again recently when I saw fellow food writer Marc, of Boston's Hidden Restaurants, post an updated list, a slideshow, of Twelve Guilty Pleasures from Boston-Area and New England Restaurants. The list includes items such as a breakfast pizza, roast beef sandwich, lobster pot pie and chicken parmigiana calzone. The question that came to my mind was: Should anyone feel guilty for eating any of these dishes? I bet Marc didn't actually feel guilty about any of those dishes. According to the Merriam Webster online dictionary, a guilty pleasure is defined as "something pleasurable that induces a usually minor feeling of guilt." It is clear that the twelve dishes listed by Marc would bring pleasure to many people. Many look appealing to me and I've certainly greatly enjoyed similar dishes. However, should he or anyone else for that matter feel guilt or shame for enjoying them? I don't think so. If they taste good, if they bring you pleasure, then you should feel good about eating those foods. Just because other people might not agree with you, that should not be a sufficient reason for you to feel guilt. Just because the dishes might not be the healthiest, that too is not a sufficient reason to feel guilty. Don't let the opinions of others indicate which foods are acceptable and which should cause guilt. You should never feel guilty for enjoying a specific dish if it brings you pleasure. As such, there is no reason to have a list of "guilty pleasures." Such lists need to be eliminated and we should instead share lists of those foods which give us pleasure, without any taint of guilt or shame. In this case, guilt is a negative emotion which needs to be eliminated. The next time someone asks you which foods are your guilty pleasures, tell them you aren't guilty about anything you eat. "The delicatessen , whether in its kosher or non kosher variant, was a second home for many Americans Jews,..."
We have seen the rise and fall of the American Jewish delicatessen, reflective of significant changes in the American Jewish culture over the last 150 years. Though you can still find kosher and nonkosher delis in the U.S., there are far less of them than once existed and they do not occupy the same central place for most Jews. What led to the deli's initial boom and what was its role in the Jewish community? Why did this all change? To understand the answers, we should read a fascinating book on the history of the Jewish deli, and more specifically the New York Jewish deli. 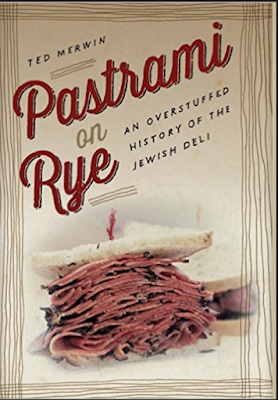 Pastrami on Rye: An Overstuffed History of the Jewish Deli by Ted Merwin (NYU Press, October 2015, $26.95) is a hardcover book of 256 pages (and is also available as an e-book). In five large chapters, Merwin explores the history of the New York Jewish deli, from its origins to the present day. During this exploration, Merwin also mentions Jewish delis in other U.S. regions though the majority of the book centers on New York. He discusses the rise and fall of the Jewish deli, seeing some hope that delis can once again rise, to help the cultural identity of Jews. "This book focuses on New York partly because it was where the majority of American Jews lived until the 1940s and partly because the Jewish delicatessen essentially began in New York and became emblematic of both New York and Jewish life." The author, Ted Merwin, is an Associate Professor of Religion and Judaic Studies at Dickinson College, where he is also the Founding Director of the Milton B. Asbell Center for Jewish Life. He writes about Jewish culture and has been published in a variety of publications, including the New York Times, New York Post, Huffington Post, Washington Post, and New York Jewish Week. "...delicatessens are oriented around the consumption of red meat,..."
The term "delicatessen" has its roots in the Latin word delicatus which means “dainty, tender, charming, enticing, alluring, and voluptuous” and was often used to refer to "sexual attractiveness." The term was adopted by a number of other languages, becoming Delikatesse in German, and now referring to "unusual and highly prized food." German immigrants to the U.S. in the late 19th century ontroduced the word, which was adopted in its plural form, delicatessen. And as such, the first delicatessen owners in New York were from Germany and Alsace-Lorraine. "...the pastrami sandwich, as we will see, became the ultimate symbol of carnal desire." There is a discussion of how "Judaism has almost always revolved around meat," referring how meat consumption was once a religious activity of Hebrews, representing the expiation of sin. This religious activity led to the curing of meat by picking, the origin of corned beef. "Cured meats and sausages entered the Jewish diet during the tenth and eleventh centuries, when Jews were living in the Alsace-Lorraine region of France." And pastrami, which originated in Turkey, became a Romanian speciality which eventually spread to the Jews. ".., in Yiddish, the word for “overstuffed” is ongeshtupped; the meat is crammed between the bread in a crude, sensual way that recalls the act of copulation. The delicatessen, after all, is a space of carnality, of the pleasures of the “flesh”—the word for meat in Yiddish is fleysh." Initially, when the first generation of Jews immigrated to New York, around the turn of the 20th century, there were over 1000 kosher butcheries but very few delicatessens. This generation preferred to cook at home and the Jewish mother would see it as an affront to her cooking skill to dine out. It would be their children, the second generation, who would start to cherish the restaurant experience, even creating a word for the experience, oyesessen. In time, kosher butcher shops started selling prepared foods, many turning into delicatessens. “There could be no picture making,” the film director Orson Welles flatly declared, “without pastrami. By the 1930s, there were over 2300 delicatessens, Jewish and non-Jewish, in New York. The famed Katz’s Delicatessen opened in 1888 and might be the first “true” Jewish delicatessen in New York. "The delicatessen enabled Jews to eat out in a Jewish way, by enjoying in public the foods that they associated with their heritage." It became a communal spot, a central gathering place for the Jewish community, to solidify their cultural identity. It was an important sense of place, the food being secondary to that aspect. "While the kosher delicatessen symbolized ethnic continuity, the nonkosher delicatessen symbolized the movement of Jews into the mainstream of American society." The book even makes mention of some specific historical delicatessens in Boston, though noting their relative lack of importance. "Other than Rubin’s, which opened in Brookline in 1928, kosher delicatessens were never very popular in Boston, perhaps because of the centrality of pork and shellfish in the cuisine of New England." This section also mentions what once was a speciality in Boston delicatessens, a sausage called cervelat which was a mixture of beef, bacon, and pork rind packed into cow intestines and then smoked and boiled. "In the mid-1950s, the shortened form deli first came into widespread use." As the 1960s arrived, delicatessens started being supplanted by another type of restaurant, the Chinese restaurant. Chinese food became a significant craze for the Jewish community and it started to become their main communal gathering spot, replacing the delicatessen. Kosher Chinese restaurants were established, helping to appeal to even observant Jews. You could even find Chinese inspired dishes at a few delicatessens, such as Salami Fried Rice or Chicken Bernstein, which was stuffed with bamboo shoots, water chestnuts and pastrami. "There is much talk of “gastronomic” Jews or “bagel and lox Jews” (the term “pastrami Jew” has not yet been coined) who presumably connect to their Jewish identity chiefly through their stomachs." Today, there are only about 15 kosher delis left in the five boroughs of New York City. Most Jews don't eat at a delicatessen on a regular basis and the deli no longer occupies a communal gathering spot. Some of the most famous delis in New York City have primarily become tourist spots. It has become more nostalgia for the Jewish community, as well as fodder for "hipster" delis. "As long as both Jews and non-Jews want to eat "traditional" Jewish food, delis will always exist on our culture." Merlin has written an interesting history of the New York deli, concentrating more on the institution than some of the specifics, such as deli food. It might have been interesting to read more about specific Jewish dishes sold at these delis, from pastrami to knishes. It might also have been interesting to learn more about the operation of these delis, from the workers to the owners. As such, this history is a very good starting point and we can hope that Merwin may expand his coverage in a sequel. With those caveats, I still recommend that you check out this book and learn much more about the iconic Jewish delicatessen. After having spent the weekend in Boston, we were headed home on Sunday and decided to grab brunch on route. There were plenty of options to consider and in the end, I chose to stop at Puritan & Co. in Inman Square, Cambridge. Puritan is one of my Top 50 Restaurants of 2015 but I never had brunch there before so I wanted to remedy that situation. Around 12:30pm or so, the restaurant was fairly busy though we didn't have to wait too long for a table. The Brunch menu, which is listed online, is slightly different than what was at the restaurant. There are around 8 Mains, priced $13-$19, with a number of A La Carte items and an assortment of Pastries. Besides their excellent wine list, you can also select cocktails, from their House Mimosa t($9) to a Bloody Mary ($10). You'll find plenty of enticing choices, reasonably priced for the quality and quantity you receive. The Beef Patty Melt ($16) has house made rye, cheese and a secret sauce, and the above sandwich added a fried egg & bacon ($4). It was accompanied by some crispy potatoes and greens. First, I have to give kudos to the rye bread which was thin, crisp and with just the right amount of sourness. Frankly, it was some of the best rye bread I've ever had. And the sandwich itself was excellent, with the thick slices of bacon, moist beef patty and gooey egg. The potatoes too were tasty, with a nice crisp exterior but that softer, puffier interior. A great choice. The Sourdough Griddle Cakes ($12) are topped with syrup, honey butter and pecans though I omitted the syrup. You receive three large and fluffy pancakes which receive a slight sweetness from the honey butter. The pecans added an intriguing textural crunch to the light pancakes. A relatively simple dish but one which was executed very well. Too many places make dry, heavy pancakes so it is always a pleasure to find a restaurant that does then right. One of the highlights of Brunch at Puritan has to be their Pastry options. At the back of the restaurant, all of the various pastries are assembled for your viewing pleasure. Each pastry costs $3 or you can get a basket of 4 for only $10. This is like having an amazing bakery in your restaurant. Back in October 2015, Puritan hired a new Head Pastry Chef, Marissa Rossi. A graduate of the Johnson and Wales’ Baking and Pastry Arts program, Marissa has worked at a number of other local spots, including Blue Ginger, Forum, and the Forge Baking Company. Since her arrival, she has created some new and intriguing items for the pastry counter, from her signature Chocolate Pretzel Croissant, to a rotating Doughnut selection. The restaurant sent us a complimentary basket of some pastries and based on what I tasted, Pastry Chef Marissa is creating some delicious and inventive treats, and I need to return to try some of the others which I didn't get to taste. You could easily come to Puritan and enjoy just a basket of pastries with a Bloody Mary or Mimosa and be very happy. On the left side are the Chocolate Pretzel Croissants, a light flaky croissant with that addition of a pretzel texture and plenty of rich, delicious chocolate. A winner for chocolate lovers. On the right are Pinwheels, made with spinach and cheese, which also were quite tasty. The Indian Pudding Doughnuts were another winner, with a light, yeast doughnut, a mild molasses flavor, crunchy nuts and the creamy pudding filling. It wasn't overly sweet and it is certainly a more unique and appealing filling. I love doughnuts so this was a treat, and so much better than what you find at the large commercial chains. It is great to see small, more artisan doughnut shops opening in the Boston area and it is great to see some restaurants stepping in as well. The Coconut Shortbread cookies are huge, and they also are delicious. Crisp and buttery, with plenty of coconut flavor. If I hadn't been so full, I would have ordered the S'mores Pop Tart which looked enticing. That will be at the top of my list when I return for Brunch. Puritan & Co. gets my hearty recommendation for Brunch and I encourage you to check out the delightful pastry creations of Marissa Rossi. We don't accept your cash. What??? This past weekend, I attended a convention at the Westin Waterfront and several food trucks showed up for the attendees. On Sunday, the two food trucks at the hotel included the Baja Taco Truck and Clover. I wanted to order something at Clover however I realized that they didn't accept cash! You can only use credit or debit cards, even if only buying a drink that costs under $2. I chose not to buy anything from the truck as I only wanted to use cash. Though I've visited a couple of he Clover restaurants during the past year, this was the first time I had visited their food truck in the last year. I was unaware that they had changed their policy in May 2015 so that their food truck no longer accepted cash, though their brick & mortar stores still accept cash. In a blog post, they stated their business was over 80% credit and then listed other reasons they believed justified the change. First, they said there were security issues with a food truck having a bunch of cash. However, as they accept cash at their brick & mortars, the chance of robbery still exists. Second, they state it takes a lot of work, basically an hour to count and deposit the cash. However, again as they accept cash at their brick & mortars, their managers still have to spend that extra time counting and depositing their cash. Third, they allege a fear of employee theft, miscounts, or errors, which still is a problem for them as they still the cash at their brick & mortars. With credit cards, there is also still a potential problem of theft of credit card numbers so they aren't preventing all theft issues. Finally, they state running out of change can be a hassle. If so many people are using credit cards, then why is this such an issue? If you start the day with a proper amount of change, it should't be an issue. I see a very inconsistent policy here, where the complaints about cash at food trucks can be applied just as well to their brick & mortars. If those concerns were so important, then their policy should be applied across the board, but it isn't. Why aren't there similar concerns for the employees who work at the brick & mortars? Why accept cash at all? It doesn't make sense to me. The no-cash policy eliminates some potential customers, anyone who doesn't own a credit or debit card. This could be seen as class discrimination, making it impossible for some of the lowest economic classes to avail themselves of the Clover food truck. For example, a homeless person who had a handful of cash couldn't buy anything at their food truck. According to a 2014 Gallup Poll, about 29% of Americans do not have a credit card, a number that has been rising over the years. That concern was raised in the comments on the Clover blog post and the founder, Ayr Muir, stated "I never thought of it that way. I hope we’re not excluding anybody with this policy." There was no apparent follow-up and I didn't see any indications that Clover was trying to address this issue. For a community business to exclude certain members of that community, about 29% of that community, seems very wrong. From the blog post comments, it was also clear that some people objected to the policy and wouldn't patronize the Clover food truck any more. This might only constitute a small group, but it is lost revenue for Clover. And it has alienated some of those people who won't now recommend others to Clover. As the policy is still around, it is apparent Clover doesn't see a significant problem by turning away those customers as well as the 29% of Americans who lack credit cards. They lost my business this weekend. It wasn't a big loss, definitely less than $10, but I might not ever go to a Clover truck again. And I won't be telling my friends to go there either. Vermont, the Green Mountain State, is the leading producer of maple syrup in the country. It is also well known for its dairy farms, cheese and Ben & Jerry's Ice Cream. In the winter, it is well known for its fabulous ski trails while in the fall, leaf peeping is extremely popular. However, its alcohol industry is much less known, except maybe for the crazily popular and hard to find Heady Topper beer. It is well past time that the rest of Vermont's alcohol industry becomes better known, from its wines to its spirits. Since 2009, I've written a number of articles and reviews of Vermont wine, cider and spirits and this year will see plenty of additional coverage. In prior year's, I've attended the Vermont Cheesemakers Festival which not only offered an abundance of cheese but also presented some of the wines, ciders, beers and spirits of Vermont, from Boyden Valley Winery to Whistle Pig Distillery. Over the years, I've seen a clear improvement and evolution of their wines and spirits. There is less use of grapes from outside Vermont and the quality continues to improve. As I mentioned last week, in the Spring I'll be spending a weekend exploring the wines, ciders, beers, Sake and spirits of Vermont, gaining a better understanding of the current status of their drinks industry. From June 3-5, I'll be attending TasteCamp 2016, which will be held this year in scenic Vermont. Approximately forty bloggers, writers and their guests will attend TasteCamp, tasting our way through Vermont. I've attended all but one of the previous TasteCamps (having missed one only because I was at the Kentucky Derby) and I expect the Vermont weekend to be as enjoyable as all the rest. As in previous TasteCamps, we will meet a variety of producers, visit vineyards, taste dozens of wines, beers, ciders and spirits, dine on local foods and hold a fun BYOB dinner. With its limited size, this is a more intimate event, allowing you to get to know everyone in the group, reconnecting with old friends and meeting new ones too. You also get immersed in the region, gaining a better understanding of its drinks industry. When the weekend is over, numerous posts and articles about the attendees' experiences will be written, sharing their new found knowledge about Vermont. Along with Lenn Thompson, Todd Trzaskos, and Remy Charest, I have helped to plan our itinerary and participants, which currently includes: la garagista farm + winery, Lincoln Peak Vineyard, Shelburne Vineyard, Fable Farm Cider, SILO Distillery, Vermont Spirits Distilling Co., Stonecutter Spirits, Shacksbury Cider, Putney Mountain Winery, Huntington River Vineyard, Prohibition Pig and Hill Farmstead Brewing. This list will continue to grow and be refined and the weekend should offer some of the best Vermont has to offer. There is even a new Sake brewery in Vermont, the Mercy Brewing Company, which I hope we can get to participate too. If you would like to attend TasteCamp 2016, there is some limited space available, but you must be a writer or other wine trade professional. You can register here to reserve a spot and if you have any questions, please contact Lenn Thompson. If you are a Vermont producer of drinks or food and are interested in participating, you can comment on this post or contact Lenn. Can't wait for Spring in Vermont! What wine pairs well with pig's tail and feet? Maybe the "Barolo of the South." In Lexington center, you'll find il Casale Cucina Campana + Bar, the third restaurant from the de Magistris family, including Chef Dante de Magistris and his brothers Damian and Filippo. Their family is from the town of Candida in the Irpinia region of Campania, which is located in southern Italy. You might be more familiar with its capital, Naples. The restaurant reflects the cuisine of that region, including a number of old family recipes. As it states on their website, "Nestled in the lush hills and valleys of the mountainous region of Irpinia lies their hometown village, Candida, where recipes survive only by word of mouth or at best are scratched on distressed pieces of paper hidden between the pages of a bible or an old phone book." The Menu presents Sfizi, small plates ($5-$11), Antipasti ($9-$16), Primi, pasta dishes (small $11-$14, large $22-$28), Pasta al Forno, baked pasta ($$14-$28), and Secondi ($21-$36). It is moderately priced, offering high quality dishes in a casual and fun atmosphere. The restaurant is very open and airy, with an open kitchen and views of Lexington center. Their wine list includes some Italian wines which the de Magistris have specially imported and are not available anywhere else in the U.S. I was invited to il Casale to experience a media dinner which showcased the wines of the Campania region. As I had just been to another Campania wine tasting the week before, I was intrigued to see how the il Casale wines would compare to those I previously tasted. Campania has a rich vinous history, extending back about three thousand years, and at least a few of their indigenous grapes extend back to the ancient Greeks. However, many wine lovers still are not familiar with the wines of Campania and that needs to change. In addition, you should check out il Casala in Lexington for some delicious food which will transport you to southern Italy for an evening. Our evening began with a white wine from the de Magistris’ private label, Phoenix famiglia de Magsitris. The phoenix is a symbol of Campania and also makes for a nice illustration on the wine label. The 2014 Coda di Volpe is produced from the rare Coda di Volpe grape and its name translates as the "tail of the fox." Campania is one of the few Italian wine regions which makes wine from 100% of this varietal. I found this wine to be pleasant and easy drinking, with tasty flavors of melon, citrus, and honey with floral accents and some herbal notes on the finish. An interesting wine, it has plenty of character and should appeal to many wine lovers. As we enjoyed this wine, we received two planks of antipasti, including one hot plank and one cold plank. The hot mix included Bruschetta with cherry tomatoes, garlic, & Sicilian oregano; Burrata with candied pistachios, honey, & Sicilian oregano; 31 month aged “vacche rosse” parmigiana reggiano; Fried calamari with lemon mascarpone, crispy lemon, & donna’s pepperoncini; Speck & warren pears with frog hollow farm pears, smoked prosciutto, arugula, gorgonzola crema, & hazelnuts; Fried mozzarella & prosciutto motto, with tomato basil salad; Potato croquette, “panzerotti,” stuffed with smoked scamorza & roasted red pepper sauce; and Arancini with white wine parmigiana risotto, truffled fontina fonduta, & chives. What an abundance of delicious flavors and textures and you could happily enjoy just some antipasti and wine rather than order an entree. I thoroughly enjoyed all of these items, though the Burrata and Speck were my two favorite bites. Everything seemed fresh, was cooked just right and each bite was nicely balanced. An excellent start to the evening. Our second wine was also from the Phoenix label, a 2014 Fiano di Avelino DOCG. Fiano is an ancient grape and its original name was Vitis apiana, Latin for "vine of the bees." This was a bright and crisp wine, with vibrant citrus and lemon flavors, a nice minerality and a bit of tartness on the finish. This would be a good pairing for seafood, or a dish with a cream sauce because of its high acidity. An excellent white wine, this would be perfect for the summer, but would also work well in the winter, dependent on your food pairing. All of their pastas are made in-house and they use different flours to make different types of pasta. The Spaghetti Puttanesca, is made with chitarra pasta, anchovies, capers, olives, and tomatoes. The pasta was excellent, with a nice texture to it, and there was some umami elements to the flavors of this dish. It was a hearty dish, perfect for a winter evening. Of the two pasta dishes though, my personal favorite was the Frutti di Mare "Alla Crema di Basilico" which was made with spaghetti, cream, clams, shrimp, mussels, and octopus. The creamy seafood was compelling and the pasta texture once again was excellent, enhancing the dish. All of the seafood was tender and again, it was a hearty dish, perfect to warm your belly during a chilly evening. Onto the red wines, starting with the 2008 Vinosia Santadrea Taurasi, which is from a newer winery but the owners have plenty of experience and now want to create their own wines. The wine is made from 100% Aglianico, maybe the top red grape in Campania and which is sometimes referred to as the "Barolo of the South." The Vinosia was produced in a more traditional style, with a deep almost black color and an intense, alluring aroma of blueberries and spice. On the palate, the wine is complex and interesting, with a pleasing melange of black and red fruits, from ripe plum to raspberries, with mild spice notes, moderate tannins, good acidity and hints of chocolate. Such a compelling wine, I was very enthusiastic about it and would highly recommend it. An excellent wine for hearty pasta dishes, wild game, steak and more. The next dish was the de Magistris family "soul food," a rustic soup from the mountains of Irpinia made with braised better greens, pigs tails & feet. For the potentially squeamish in our group, all of the meat had already been removed from the tail and feet so you wouldn't have known where the meat came from if you just looked at the dish. Back in Campania, you would have found the actual tail and feet in our dish, which I would't have minded. The tender meat was delicious, with a superb savory broth, and it paired perfectly with the Vinosia, answering my initial questions in this post. Though the sound of the dish, tail and feet, might turn you off, it would be a mistake not to try this tasty dish which would please any meat lover. The 2008 Vinosia Marziacanalae Taurus, also made from 100% Aglianico, is more of a modern, international-style wine. It is a silky smooth wine with black and red fruit flavors but also a strong vanilla streak, almost giving it a hint of sweetness. It is a style that will appeal to wine lovers though my personal preference was for the more traditional style wine. I think the more traditional style better reflects the region of Campania as the modern style can be found in many areas around the world, from California to Australia. The last savory dish was the Pizzaiola, Neapolitan braised beef, San Marzano tomatoes, roasted potatoes, pine nuts, and raisins. Once again, the meat was very tender and flavorful, with crispy potatoes, and it paired well with the wine, though I think the traditional style Vinosia was the best of the two pairings. The pine nuts added a nice crunchy texture to the dish, as well as their own nutty flavor. The last wine of the evening was the 2009 Vinosia Sesto A Quinconce Aglianico, one of the top wines from this producer. It is 100% Aglianico, from vines that are at least 75 years old, and they make only about 500 cases each year. It is dark and deep, intense and muscular yet still with plenty of elegance and restrained tannins. Back fruits, spice, cocoa and so much more can be found in this complex and intriguing wine. It is more in the traditional style and I was thoroughly impressed, finding so much to like about this wine. Highly recommended! For dessert, we had a Rum Baba with pastry cream, amarena cherries, and crushed biscotti. A nice blend of flavors and textures, it was light enough that almost anyone could find some room tin their belly to enjoy this dessert. We also enjoyed some Piccolini, a variety of cookies including Florentines, Biscotti (chocolate hazelnut and almond,) and Lady Fingers with apricot. The Florentines were my favorites. Before I left, I had to try their Meletti Barrel Aged Manhattan, which is made with Overholt Rye, Meletti Amaro, & Amarena cherry. A deep and savory cocktail, it had some intriguing spice and herbal notes, with a nice bitter tinge. It is an intriguing variation of a Manhattan, substituting Amaro for Vermouth, and it works very well. No Manhattan lover should object to this cocktail and the barrel aging seems to provide some added depth to the drink. Check it out! And seek out the wines of Campania, both their whites and reds.